"In order to make for you possible as early a picture as possible, as the new M DKG Drivelogic feels, we gave first the opportunity to the moderators of the MPW to also be in vehicles on the test track thereby. A word still to the mentioned "over moments". Simplified one can introduce oneself in such a way: if a course is more highly switched, the engine with a too high number of revolutions for the new translation runs. If one couples now according to fast (which knows the M DKG Drivelogic), the engine is braked, in the engine stored energy becomes free – propelling rank affects an additional moment, the car experiences a noticeable, positive thrust forward, which a measurable acceleration advantage meant (and besides also still the heart a little more highly to strike leaves). Interests one that not, selects one against it a low Drivelogic stage and enjoys the full comfort, the shifting process feels then accordingly gently. Much fun with the user reports! Greeting, cm"
"My first meeting with the M DKG Drivelogic. I already could read some over the M DKG Drivelogic in the MPW and various automagazines. However so far still no meaningful driving test. As eingefleischter SMG a fan, that drives at present with hand switch, me the described technology and I interested zollte the described possibilities even mean respect. However I could not imagine an M with a double clutch transmission, which I knew from the VOLKSWAGEN company, to move. That did not fit in my eyes. When one offered to me then yesterday, in a M3 Limo with M DKG Drivelogic to ride along I was very strained. There are as also with the SMG, 11 different drive positions. 5 in the mechanism and 6 in the manual mode. As we drove off were we in the stage 4 of the manual mode. Acceleration was as however with the SMG with short noticeable switching interruptions, without course interruption. Figurativy avowedly like that as only with the SMG, the legendary SMG is head nodding, through which existing course interruption does not go, only to the rear. With shift down formed then with me very fast a broad Grinsen, because it was, the Zwischengastompeten of the V8 well-known of the SMG there. In the stage the course change carries out itself 5 and 6 of the manual mode improbably fast, but noticeably noticeably, however with so brutal impacts which of the SMG does not admit is. When switching up to the 3 course in mentioned above modes, with full acceleration, one feels also a short slip of the rear wheels. A Launch Controll is also present and functioned as with the SMG. In the display between the round instruments the black-and-white cross-hatched flag is faded in and then goes it brachialst, with short course change jerks forward. The mechanism mode so extensively one did not test. In the stage 1 and 2 it is however really like that as in the AUDI advertisement that one nearly imperceptibly and very fast with full acceleration in 7. Course lands. In contrast to the SMG, also slowly a driving mode was implemented, which keeps as with a transducer mechanism, the vehicle slow in the propulsion. That is surely very helpful for ranking and during pilot travels. As short result I must state that against my fears the M DKG Drivelogic is not soft-washed SMG, but a real advancement its is. Very successfully. I am sure me that it will make improbably fun for me, if I may drive the M DKG Drivelogic the first time. I only an absolute judgement Esrt will then be able to form and hope the fact that my impressions, which for me from the front seat passenger side formed are confirmed. Greeting Franzl"
1. Park mechanism with the DKG can be finally turned off now the car in each transmission position and an automatic parking lock blocks the transmission as soon as one the key from the lock takes. Things like "to it to pay attention which one the first course when turning off inserted" and "which one" attaches "when starting the transmission on position" N to belong thereby the past. 2. "creep mode" with a parks and with stop and Go travels in the back-up supports the new M DKG more ever. If the vehicle stands, thus all wheels were stopped, touch one completely carefully the accelerotor pedal lightly and the car catches actually completely slowly to move. Functions both in the forward gear and in the reverse gear. Thus an assistance when packing up the vehicle. 3. "mountain starting mode" one should have to start once at the mountain in such a way supports the new M DKG in contrast to the SMG also with this situation. At the SMG one did not have to possibly work with the emergency brake as an assistance thereby the car to the rear rolls away. With the M DKG the brake for approx. remains. 3-4 seconds after that release the brake pedal of the system further pressed so that one sufficient time have on the accelerotor pedal to change and this press. The brake is only then loosened and the cars induces themselves to roll forward without a mm to the rear. One presses within this time the accelerotor pedal does not loosen the brake and the cars rolls to the rear. 5. If one with the long-known SMG gladly in the steps 2-3 then nevertheless repeatedly rather surprises itself one drove steps with the DKG in the steps 4-5. The "switching impacts" of the rear axle as with the SMG belong to the past with the DKG because of the missing traction power interruption simply. The course change effected consistently and without the feeling to have equal one the rear axle from the mounting plate tears. 6. Wear of clutch is there with the M-DKG two clutches in an oil bath werkeln, thus a wet coupling system blocked, could possibly positively the wear of the clutch affect. Surely two clutches must be exchanged however the durability should also twice as for a long time work with the change. Also sport starts with the help of Launch control the mode do not affect themselves during an oil bath clutch as strongly on the wear of the clutch as during a conventional trockenkupplung. It is however here nevertheless mentioned that a Launch control start not only on the clutch goes but also the other drive components such as cardan shaft, balance joints, rear axle, drive shaft and to does not forget the tires in to be pulled. Thus also here always about it think whether be real must! Summary: For me the new M-DKG Drivelogic a "new development" is not personal separates a better SMG than the versions before it. 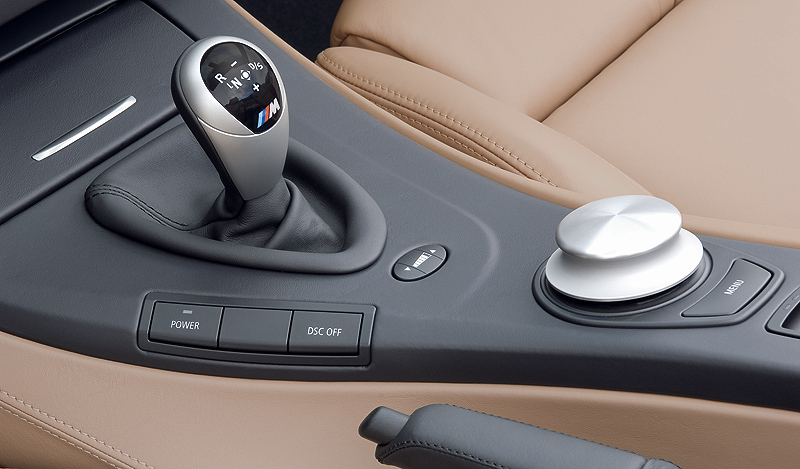 Surely the entire transmission concept is a new and by another technology realized however for the BMW driver is DKG an improved SMG and sets at the point where the SMG development exactly stopped. An appropriate BMW M new vehicle in my vehicle park will have in any case DKG Drivelogic if the vehicle concept is correct. Who SMG to suffer can becomes DKG to love! Greetings TOM"
My expectations to the m Dkg were very high. At the same time I was very sceptical, since I am a genuine SMG II (in the M3csl) fan and DKG transmission drove so far only times into two Audis. That was completely nice, but under sporty regard very much disappointing. The offer the new M-DKG, even if only as passengers to experience was thus much enticing. The result already times in front: Who likes SMG, becomes also the new M-DKG love. I it to certainly take. Why? 1. There are as with the SMG 11 different drive positions. 5 in the mechanism and 6 in the manual mode. For play children thus again somewhat one orders. 2. There are still lives in the car, since in the high drive positions still switching jerks are vernehmbar. Only evenly no longer so brachial, but however more material-carefully. In the low flow programmes that is already rather a linear acceleration, in the high against it switches the M-DKG unbelievably fast and precisely. That makes mood. 3. The mechanism mode is now clearly stronger at the "genuine mechanism to, than before. That can be also pleasant for moments rather rare (with me). 4. The creep function to a parks, stop and Go driving and ranking is very good! 5. The Paddles felt well – after genuine metal hopefully is in the series then also like that. 6. The tuning with the remaining monitoring systems is ravine and simply perfectly – mA already notices when riding along. The new transmission could thus quite be called SMG IV – it is (for me) rather a far development of the old SMG technology, which had also the well-known inspiring potential. Only evenly with the latest current technology. I freu` me already on an extensive test run on my living straining. Times sees, what I can communicate then for impressions. What if this were the F10 5er? More than likely the bizarre English is the result of a literal translation from German, thus the almost nonsensical ramblings…Still, I was able to digest the meat of the report, which seems to be rather positive….